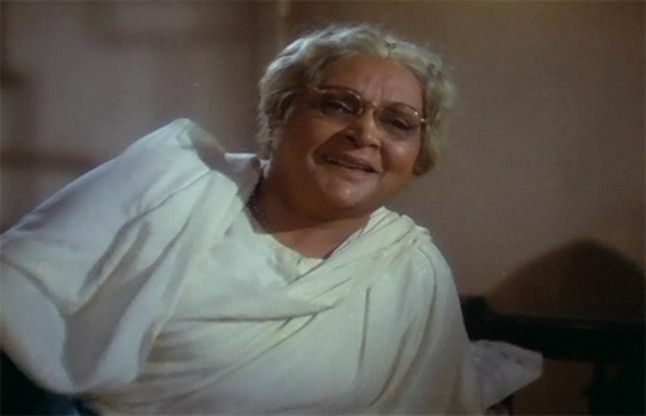 Durga Khote was a familiar face in the Bollywood flicks for nearly five decades, from the 1930s to the 1980s. She was a class apart from other cine stars of that period. In her lifetime when it was still highly common for women to be largely unlettered and unschooled, she created a record of sorts – completing her higher secondary education from a missionary school and next enrolling for a bachelor’s degree programme. In an era when female characters were portrayed by menfolk she was a pioneer of sorts – daring to appear in public and enact female roles. Yes, nearly three decades after her demise, Durga Khote is remembered and venerated by discerning cine-goers. Akin to her namesake deity the talented lady left an indelible impact on B- town of a bygone era. She was born as Vita Laud on 14th January 1905, in a well established Maharashtrian/Konkani family based in of Bombay. Since hers was an elite family she was allowed to pursue her education at Cathedral High School followed by St Xavier’s College, Bombay. While still in college she entered a negotiated matrimonial alliance with Vishwanath Khote, a mechanical engineer who was an alumnus of Benaras Hindu University. In an era when female characters were portrayed by menfolk she was a pioneer of sorts – daring to appear in public and enact female roles. The couple lived a harmonious conjugal life and were eventually blessed with two sons. However the domestic bliss was short lived. At 26 Durga was widowed with two young children. Though she chose to remain with her in-laws yet she was disgruntled as she did not wish to be dependent on them. Since she hailed from a liberal social milieu and moreover had received western education she felt it was worthwhile to try her luck in the tinsel world. Durga always had a predilection for the stage, theatre, and acting. The first opportunity came when her sister Shalini, who was a friend of producer JBH Wadia, coaxed and persuaded her to appear in his silent film Farebi Jaal (1931). Quite naturally, she received brickbats aplenty. The public could not reconcile to the idea of woman, whose family was crème de la crème of society opting for such a ignominious career. However Durgabai (as she was popularly called) stuck to her guns and continued to appear in more films. Thus she became a trailblazer, in the sense that many more respectable women were inspired by her to seek a career in films. Her major breakthrough came when she was spotted by the legendary director V Shantaram who offered her the role of Taramati in his bilingual (and significantly his first) talkie captioned Ayodhya Ka Raja (1932). Durga Khote delivered a brilliant performance and left the audience enthralled. Over the next few years her acting in landmark films like Sairandhri (1933), Amar Jyoti (1936), Mahatma Vidur (1943), Veer Kunal(1945), and many more showcased her multi-dimensional talent. She performed in historicals, mythologicals, and social realist films with equal confidence and élan. Interestingly Durga Khote’s characters reflected her persona and the lofty ideal of women empowerment. The women she played were strong-not demure doormats-they faced the world on their own terms. and accepted challenges of all sorts. For instance in Amar Jyoti, she was a female pirate who planned to overthrow a kingdom. In Bharat Milap (1942), she essayed the vile character of Kaikeyi, who craftily wrested the throne from her step son. However by any computation, her most scintillating performance was in the blockbuster/classic Mughal-e-Azam in the shape of Jodhabai, the consort of emperor Akbar and the doting mother of Salim (Aka Jahangir) the hero of the film. Her innate grace, stature and screen presence perfectly matched the aura of thespian Prithviraj Kapoor who played the mighty Akbar. Therein too she played a woman of substance with a mind of her own. Indeed a strong woman torn between duty towards her husband and love towards her son. She pleaded with Salim as a benevolent queen who did not want to see her kingdom ravaged. As the story goes, while the film was in the works, director K Asif kept renewing and refreshing the cast, only retaining Durga from the beginning till the end! This only goes to show that Asif held her in high esteem. She has another first to her credit. In fact she broke down the shackles of the ‘studio system’ which involved exclusive contract with a studio and working for in-house productions only. Thus she turned a freelancer and chose to work for a couple of Calcutta based companies like New Theatres, and East India Film Co, besides Prakash Pictures headed by noted director Vijay Bhatt. Durga Khote was equally at ease on stage. She was a member of the Indian People’s Theatre Association (IPTA) where she rubbed shoulders with titans like Balraj Sahni, Prithviraj Kapoor K.Abbas and many more. She gave a laudable performance in Rajmukut, a Marathi adaptation of Shakespeare’s Macbeth in the role of Lady Macbeth. her brain child Durga Khote Productions was the country’s first ever advertising agency to be headed by a woman. Her courage, grit and determination encouraged other aspiring women like Shobhana Samarth (actress Tanuja’s mother) to turn to films as a serious profession. How many of us know that she was also an astute business woman? In the early 40s, her brain child Durga Khote Productions was the country’s first ever advertising agency to be headed by a woman. The company went on to produce a popular Doordarshan soap Wagle Ki Duniya. Significantly Durga Khote’s substantially long career was totally unblemished by scandals or controversies. After Mughal-e-Azam she had a conspicuous role in Merchant Ivory’ s debut film titled The Householder (1963). Thereafter she began appearing in Bollywood potboilers and family dramas where she bagged divergent roles – The heroine’s grandmother in Bobby (1973), Subir’s aunt in Abhimaan (1973), a soft hearted mother in Bidaai (1974), among many others. At almost the fag end of her career Durga acted in Karz (1980) first as the hero Rajkiran’s mother and later as the mother of his reincarnation Rishi Kapoor. Fortunately for Durga Khote her skills and talent were recognised and duly appreciated during her lifetime. In 1958 she bagged the Sangeet Natak Akademi award for excellence in films. 1n 1942-43 she won the Bengal Film Journalists (BFJA) for best actress for her roles in Charano ki Dasi and Bidaai. In 1975 she received the Filmfare Award for best supporting actress for Bidaai. She was awarded the Padma Shri in 1968. Last but not the least she received the highly coveted Dadasaheb Phalke Award for lifetime recognition in 1984. On a pleasant autumn day 22nd September 1991 in Mumbai, Durga Khote took her final bow from the world of entertainment and performing arts. She was a few months short of turning 87! Her passion for acting has been upheld and kept alive by siblings Shubha and Viju Khote who are children of Nandu Khote, Durga’s husband’s brother. On 3 May 2013 a postage stamp was released by the Indian postal department in her honour. Next articleFrom Shankar To Pranay: Why Does Caste Extremism Continue To Haunt Our Nation?